The 71-year wait is over for India. 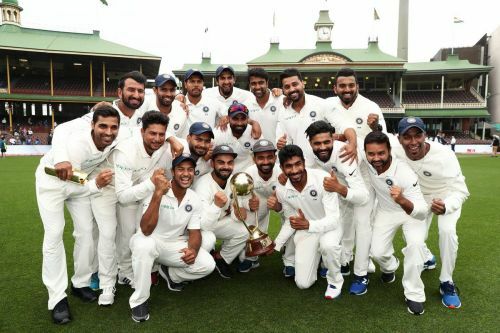 India have finally won a Test series in Australia. The series would have much sweeter if they had won the final Test too but this day will be etched in history as India beat Aussies by 2-1. While the Man of the Series, Cheteshwar Pujara held the batting together and the Indian bowling showed everyone their might. Pujara with three centuries in this series scored a total of 521 runs in 1258 balls, 1861 minutes (31 hours, 8 minutes). Pujara has been India's got to batsman right from the first Test. He scored a century in the first innings and half-century in the second and helped India post 250 and 307 respectively. A collective effort from the Indian bowling line-up meant that Australia lost the match by 31 runs. In the second Test, it was Indian skipper Virat Kohli who scored a century but that was not enough for India to get close to the home team. Nathan Lyon the man of the match troubled the Indian bowlers throughout the match and ended up picking eight wickets. India bounced at MCG in the third match and centurion Pujara was at the centre of it again. His 170-run partnership with Kohli put India well and truly on top of the game with a total of 443-7 in the first innings. The Australian batting line-up could not withstand the might of the man of the match Jasprit Bumrah. Bumrah's nine wickets in the match helped India win the match by 137 runs. In the final Test, India posted a massive total of 622-7 in the first innings, thanks to centuries from Cheteshwar Pujara and Rishabh Pant. The huge total meant that India were close to another victory as they enforced a follow-on after bowling out Australia for 300 in the first innings but the rain Gods did not allow that to happen. As a result, the final scoreline read 2-1 in favour of India and India became the first Asian side to beat Australia in Australia.